Q1. __________ An asset, including a leased asset, becomes non­ performing when it ceases to generate income for the bank. Sol. Non ­performing Assets (NPA) is an asset, including a leased asset, becomes non­ performing when it ceases to generate income for the bank. Sol. NPA stands for Non ­performing Assets. Q3. MUDRA is a financial institution has been set up by Government of India for development and refinancing micro-units’ enterprises. What is the meaning of "A" in MUDRA? Sol. MUDRA, which stands for Micro Units Development & Refinance Agency Ltd, is a financial institution being set up by Government of India for development and refinancing micro units’ enterprises. Sol. India was one of the first in Asia to recognize the effectiveness of the Export Processing Zone (EPZ) model in promoting exports, with Asia's first EPZ set up in Kandla, Gujarat in 1965. Q6. The concept of insuring deposits kept with banks received attention for the first time in the year ___________ after the banking crises in Bengal. Sol. The concept of insuring deposits kept with banks received attention for the first time in the year 1948 after the banking crises in Bengal. 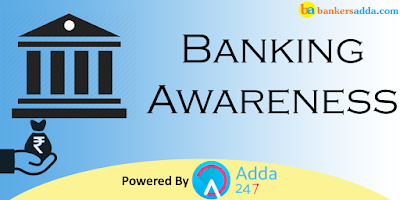 The question came up for reconsideration in the year 1949, but it was decided to hold it in abeyance till the Reserve Bank of India ensured adequate arrangements for inspection of banks. Subsequently, in the year 1950, the Rural Banking Enquiry Committee also supported the concept. Sol. The Deposit Insurance Corporation (DIC) Bill was introduced in the Parliament on August 21, 1961. After it was passed by the Parliament, the Bill got the assent of the President on December 7, 1961 and the Deposit Insurance Act, 1961 came into force on January 1, 1962. The Deposit Insurance Scheme was initially extended to functioning commercial banks only. This included the State Bank of India and its subsidiaries, other commercial banks and the branches of the foreign banks operating in India. Q8. The Reserve Bank of India was promoted a public limited company on January 14th 1971, named the CGCI. What was the meaning of first "C" in CGCI? Sol. The Reserve Bank of India also promoted a public limited company on January 14, 1971, named the Credit Guarantee Corporation of India Ltd. (CGCI). The main thrust of the Credit Guarantee Schemes, introduced by the Credit Guarantee Corporation of India Ltd., was aimed at encouraging the commercial banks to cater to the credit needs of the hitherto neglected sectors, particularly the weaker sections of the society engaged in non-industrial activities, by providing guarantee cover to the loans and advances granted by the credit institutions to small and needy borrowers covered under the priority sector. Q9. The DIC Bill was introduced in the Parliament on August 21st, 1961. What is the meaning of "D" in DIC? Sol. The Deposit Insurance Corporation (DIC) Bill was introduced in the Parliament on August 21, 1961. After it was passed by the Parliament, the Bill got the assent of the President on December 7, 1961 and the Deposit Insurance Act, 1961 came into force on January 1, 1962. Sol. DICGC stands for Deposit Insurance and Credit Guarantee Corporation. Q11. ______________ is basically charged when a person uses a credit card to obtain cash. Sol. A cash advance fee is a charge that a credit card issuer charges a customer for accessing the cash credit line on his or her account, either through an ATM, convenience check or at a bank’s teller window. Q12. Which is an interest-free period that is to be given by a creditor to the debtor? Sol. The grace period is the provision in most loan and insurance contracts which allows payment to be received for a certain period of time after the actual due date. During this period no late fees will be charged, and the late payment will not result in default or cancellation of the loan. Q13. ________ is a cheque rather an amount of cheque, which is above the balance available in the account of the payer. Sol. An overdraft is an extension of credit from a lending institution when an account reaches zero. An overdraft allows the individual to continue withdrawing money even if the account has no funds in it. Sol. Traveller’s cheque is a medium of exchange that can be used in place of hard currency. Traveller’s cheques are often used by individuals travelling on vacation to foreign countries. Q15. Which of the following is not a measure of the Risk Management in Banks? Sol. Cash reserve Ratio (CRR) is the amount of funds that the banks have to keep with the RBI. Statutory liquidity ratio (SLR) is the Indian government term for reserve requirement that the commercial banks in India require to maintain in the form of gold, government approved securities before providing credit to the customers. Deposit insurance is mandatory, and pays claims from a pool of funds to which every depository institution regularly contributes.